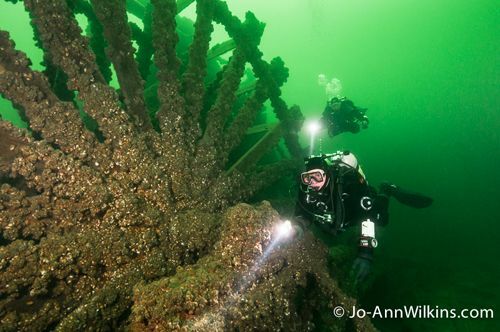 The St-Lawrence River and Eastern Lake Ontario, both lying between the United States and Canada, are popular dive destinations. Their riverbeds are littered with hundreds of beautifully preserved historical and recent shipwrecks – a combination of their strategic location within the continent for the shipment of merchandise and bulk freight along with their many navigational hazards. 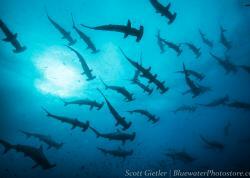 The area is known to many as being the World’s Best Fresh Water Wreck Diving destination. 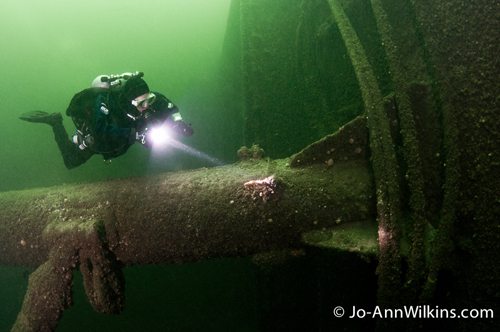 Diver photographing the sidewheels of the Comet. Eastern Lake Ontario. F 7.1, 1/60, ISO 500. Nikon D300 Tokina 10-17mm. Divers on a relatively intact portion of the deck of the Comet. Eastern Lake Ontario. F 7.1, 1/50s, ISO 500. Nikon D300 Tokina 10-17mm. 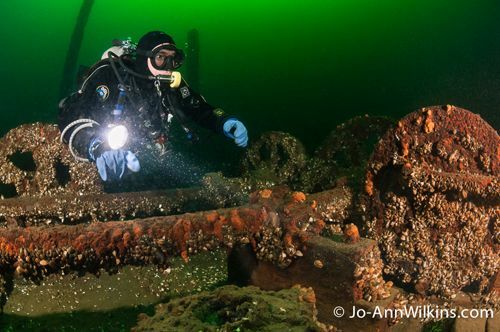 Divers can explore the machinery, an old crane and the ship’s original1890s tools laid out on deck. Wreck of the Munson. Eastern Lake Ontario. F 7.1, 1/30, ISO 640. Nikon D300 Tokina 10-17mm. 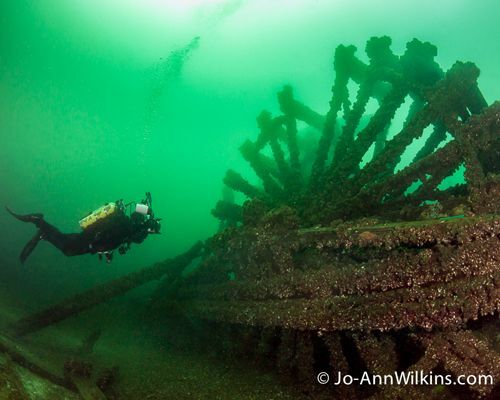 The wrecks are incredibly well preserved. The fresh water in which they rest lacks the saltwater organisms that would normally destroy their structure, while the cold temperature (with its low oxygen levels) preserves them. 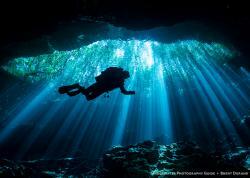 Deeper wrecks are better preserved as a result of less exposure to light. 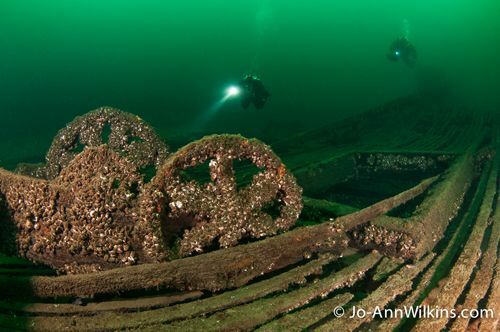 The wrecks of the St-Lawrence River, more precisely between Watertown and Massena on the American side and Kingston and Cornwall on the Canadian side, are preserved in cold water for most of the year. However, during the summer months, the water temperature rises to the mid seventies with no thermocline and is thus very comfortable. 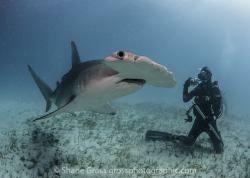 This is one of the reasons this dive destination so popular for divers on both sides of the river. 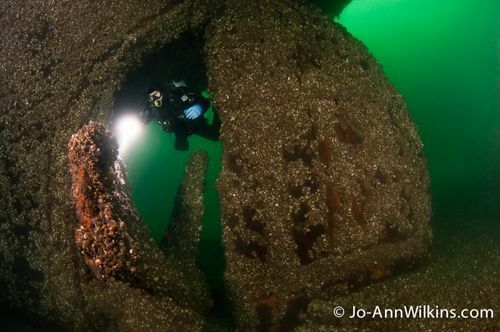 A diver exploring the 12-foot high rudder and 4-blade propeller on the Glendora. Eastern Lake Ontario. F 7.1, 1/40, ISo 640. Nikon D300 Tokina 10-17mm. The former dive vessel Effie Mae. She was scuttled next to the Aloha after she was retired. Eastern Lake Ontario. F 8, 1/60, ISO 500. Nikon D300 Tokina 10-17mm. Inside the machine room of the very popular ferry Wolf Islander II. F 6.3, 1/15, ISO 500. Nikon D300 Tokina 10-17mm. The border between the Canadian and American side is in the middle of the river in most places, and as a result, some wrecks lay on the Canadian side and others on the American side. 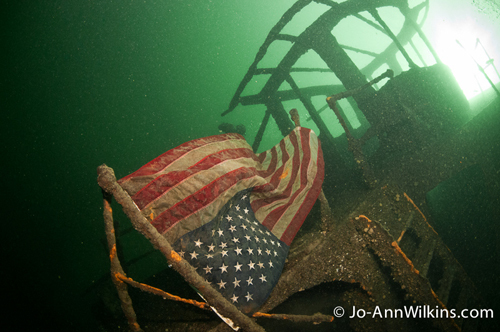 Crossing the border to go dive on a wreck is no simple task. Many of the dive trips depart from Rockport, Canada. 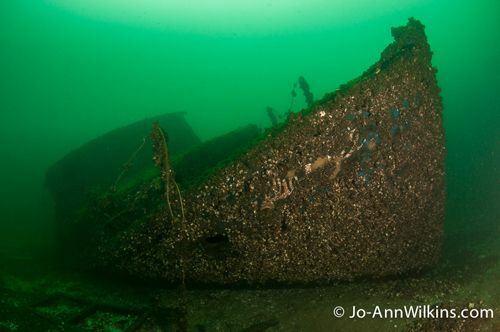 American divers cross the border into Canada by car, board a Canadian vessel and must then go through customs again on an American island (Heart Island in the Alexandria Bay area) to be able to go dive on an American wreck. After the dive, they must pass through Canadian customs and then head back home by car and go through customs yet again. Does this sound complicated? Well, it sure is… and it’s also a funny sight to see. When the customs open on the island in the morning, you have dive vessels lined up eagerly waiting to go through to be able to be the first ones on dive sites. 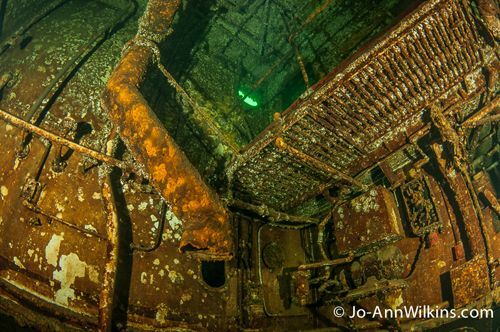 There are some American vessels that can take American divers on American wrecks without this border crossing commotion but if they want to go dive the Canadian wrecks, they must also go through customs. Exploring one of the masts on the Keystorm. F 6.3, 1/30, ISO 800, Nikon D300 Tokina 10-17mm. The wheelhouse on the Keystorm. This ship rests in US waters. F 9, 1/125, ISO 800. Nikon D300 Tokina 10-17mm. The stern of the Keystorm resting on a clay bottom. F 5.6, 1/30, ISO 400. Nikon D300 Tokina 10-17mm. 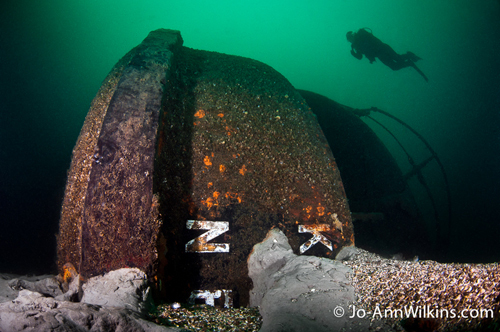 Continue to Page 2 for more Photos, Wreck Info and Photography Tips!